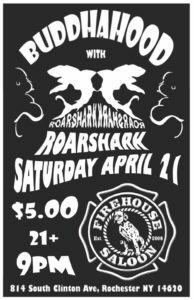 The Buddhahood + RoarShark at Firehouse Saloon! Making up this highly creative and entertaining ensemble are eight members, with a wide spectrum of character and musical background. Know for their multi-instrumental, powerhouse sets, The Buddhahood represents with a variety of vocal styles, percussion, guitar, horns, bass and keys in shades of Roots, Rock, Reggae, Funk and Afrobeat in a flavor they call “Worldternative” as each song forces you to stay on the dance floor.